In 2000 Hoffmann et al demonstrated the synthesis and reactivity of a chiral Grignard reagent. These compounds can not ordinarily be made from the standard reaction of an (chiral) halide with magnesium metal because the stereogenic carbon atom next to magnesium at one point is a free radical with accompanying racemisation. In the 2000 experiment the chiral Grignard was therefore prepared in a rather outlandisch reaction between a chiral sulfoxide (1) and three (!) 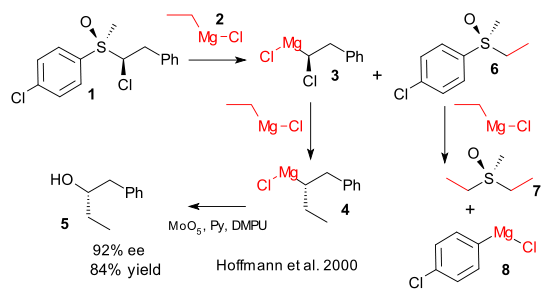 equivalents of ethyl magnesiumchloride (2). The first one in an exchange reaction to intermediate 3, the second one in a substitution reaction to form the actual chiral Grignard 4 and the third one by necessity in a reaction with the sulfoxide byproduct 6 to ultimately form diethyl sulfoxide 7 and aryl magnesium chloride 8. Is there a better way? Judging from a recent publication in Organic Letters, Chen/Fu and Xu think there is. They argue that an alternative pathway to didical formation exists by direct insertion of Mg into the halide C-X bond. In computer simulations (DFT) they reacted a hypothetical Mg4 cluster with methylbromide. Predictably the radical pathway has a much lower activation energy (with in the TS one radical delocalized over the entire Mg cluster) than any of the nonradical pathways.